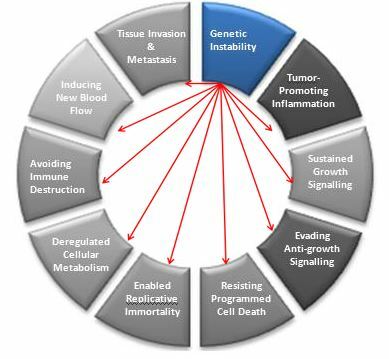 The Hallmarks of Cancer framework illustrates that two important enabling characteristics of cancer are Genetic Instability and Inflammation (shown below). Factors that contribute to genetic instability have long been known to contribute to cancer, and a considerable amount of regulatory effort has gone into making sure that we are not exposed to chemicals that cause genetic damage. However, chronic inflammation is now known to be notorious in its ability to instigate many of the major mechanisms that contribute to cancer (as shown below), but there are almost no regulatory restrictions on disruptive chemicals that can directly or indirectly cause this sort of inflammation to occur. 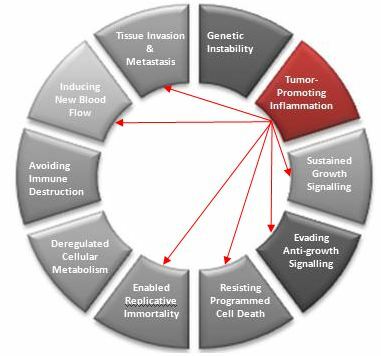 In addition to the consideration of the two enabling mechanisms shown above, it is instructive to look at the process involved in tumor development, and the spread of cancer to really understand how cancer evolves and ultimately becomes lethal,. The first mechanism that must be enabled is sustained growth signalling. All cells are capable of growing, dividing and making copies of themselves through a process called mitosis. 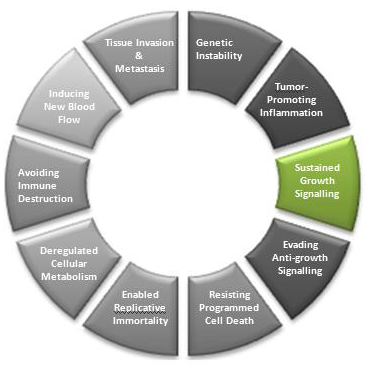 When cells are genetically damaged (or chemically instigated) in such a way that sustained growth signaling results, the resulting proliferation of cells can cause congestion over time (i.e., too many cells crowded into the available space), which is known as a tumor. As the mass of resulting cells form into a tumor (shown below), the cells in the center of the mass become deprived of oxygen. Without oxygen, the mitochondria in these cells (i.e., the energy centers in the cells) switch to glucose consumption which enables them to survive in the oxygen deprived environment. 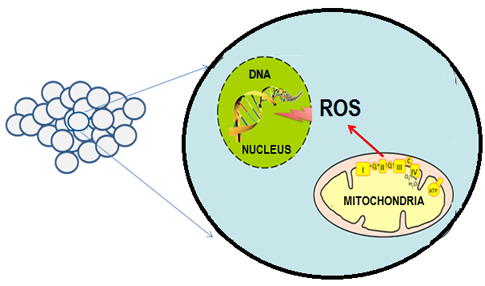 However, that changeover also causes harmful chemicals called Reactive Oxygen Species (ROS) to be generated and released by the mitochondria, and these agents can further damage to the cellular DNA (which contributes to genetic instability). 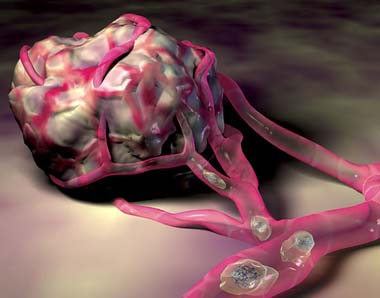 The illustration below shows how a single immortalized cell can grow into a tumor. Initially, the dysfunctional cells may all be similarly dysfunctional, but once the cells in the center of the tumor become oxygen deprived, the shift in cellular metabolism and the resulting Reactive Oxygen Species (ROS) begin to wreak havoc by further damaging the DNA. So as the cells continue to proliferate, new types of mutated immortalized cells emerge. These unique subpopulations of cells are depicted below in multiple colors. 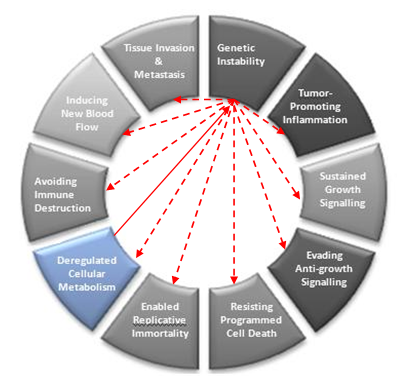 This is intended to underscore the fact that tumors are frequently made up of a number of subpopulations of immortalized cells that are all acting similarly (i.e., proliferating), but actually each of the subpopulations may be using unique and varied types of genetic mutation to achieve their immortality. So this makes it very difficult to stop cancer, because there are often many different types of mutated cells that need to be stopped. The second thing that these oxygen-deprived cells do to ensure their survival is they begin to generate chemical signals for new blood flow by releasing growth factors (such as Vascular Endothelial Growth Factor – VEGF). In response to this signaling, new blood vessels sprout from the existing vasculature and grow in and around the tumor to supply the needed blood to these oxygen-deprived cells. Finally, the cells in the tumors begin to invade nearby tissues by releasing enzymes called Metalloproteinases (MMPs). The cells within the tumor also lose their adhesiveness and move into the nearby tissues in a process called metastasis. This is the principal factor responsible for most deaths in cancer. 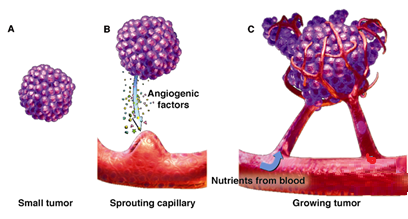 Cells detach from this tumor and enter the bloodstream (shown below), or the lymphatic system and as they travel to other parts of the body they can give birth to a secondary tumor. The chances of this happening are low, because the immune system normally stops these sorts of cells from establishing new colonies, but when it does happen, the spread of the cancer to other sites greatly reduces the chances of survival. The most remarkable thing about this entire process is that it happens at all, because we have several powerful self-defense mechanisms that should stop this from occurring. Yet each of our defense mechanisms is somehow suppressed, bypassed or beaten in the process. So it is critical to look at these other hallmarks, because it can helps us to understand what steps might be taken to prevent cancer, and also what can be done to improve the way we treat the disease.